In part one of this feature, we explored why the time is right for internet TV. Now we look at the main challenge: content. "I think what Joost has done is absolutely fantastic. Joost , Babelgum , there are a whole host of companies about to collide in this space," says Andrew Wilding, European MD of Vividas . "Content is king," says Wilding, repeating the oft-used adage. But Ranjan warns there may be difficulties for networks like Joost in the future. "If you're going to go into the aggregating business, it's going to be very difficult for a company like Joost." However, Joost's relatively high profile has so far secured it content deals with the likes of TimeWarner , Viacom and Sony. So it's well-placed in this area - even if the content on the current Beta service is rather sparse. 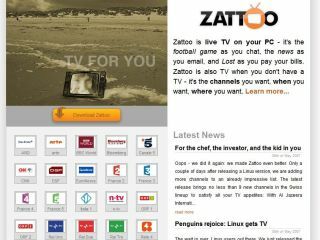 Zatoo is a contrasting service that streams whole channels of content, such as ITV1 and MTV, onto your PC. "Marketability and demand for content is the factor. A lot of the rights holders are happy to make back catalogue content available," says Wilding. It's the newer content that is the issue though. "A lot of content is held away from online distribution until it is distributed through the other windows. [Content owners] protect their cinema window, then the DVD window. Then they're ready to pt it into an internet window." Wilding thinks the situation will change. He points out that digital music distribution originally appeared three weeks after the CD went on sale. "The real watershed will be when the content is available in that window at the same time. But it's exactly how the digital music world started. "[People will think] of the PC and TV as just two terminals you can see content on...all they want is to consume the content in the way they want." Amimo's Ranjan disagrees that device doesn't matter. "One of the biggest tricks that [internet TV providers are] missing is that they're all building apps for a PC experience. The biggest gap in the industry is moving the content to where the user is comfortable." "We don't think consumers are worried about where the content comes from," adds Screen Digest 's Arash Amel, who believes it's a challenge for content providers. "People are able to record a whole TV programme and put it on peer to peer sites and some consumers are doing this. That's a challenge for rights and content owners who will need to address it via technology like territorial blocking to their content." Providing internet TV is also about infrastructure - and it could turn into a real millstone round the neck of such services. Joost has recently reported server issues and other startups and new services are likely should expect similar initial problems. "Guaranteeing quality of service is one of the main issues facing the business model of broadband TV," says Kieron O'Brien, CEO of internet infrastructure firm PacketExchange . "The internet was originally designed for academics by academics as a simple means to exchange raw data. Even back in 2000, the public internet was being asked to do things it wasn't capable of." Last word to Babelgum's Erik Lumer - who strangely doesn't share the same concern. "There is clearly a requirement for bandwidth, however the core technologies in use are highly efficient and likely to become more so. In addition broadband capacities around the world are increasing every year. "Up to 8MB in the UK is likely to be the norm very soon and Babelgum currently requires users to have access to 500KB." Let's hope we continue to share his optimism as the race for broadband TV audiences hots up. You can also read our full interview with Babelgum's CEO Erik Lumer.